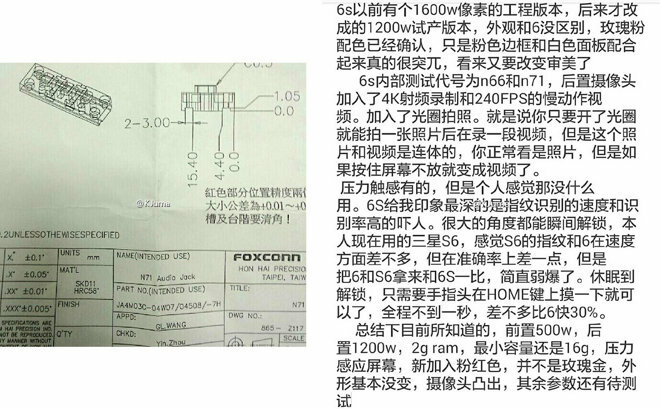 A document appearing to include a leaked Foxconn manufacturing schematic may back claims that Apple's next-generation "iPhone 6s" series will feature a 12-megapixel rear-facing camera, 4K video, and 2 gigabytes of RAM. The document was initially posted on Chinese site Weibo by someone claiming to be a Foxconn worker, but that post has since been deleted, Phone Arena said on Thursday. Images from it are now circulating the Web, and reportedly cite an N66 model number for the iPhone 6s, and N71 for the 6s Plus. Both the "iPhone 6s" and "iPhone 6s Plus" are said to have 12-megapixel rear cameras, as well as support for 4K and/or 240 frames-per-second slow-motion video. The iPhone 6 and 6 Plus already have 240 fps video, but are limited to 1080p resolution, since their sensors top out at 8 megapixels. The document also points to 5-megapixel front-facing cameras, a major leap from the 1.2 megapixels on current iPhones. Some rival smartphones, such as the Samsung Galaxy S6, have already made the leap to 5 megapixels. Although the source of the material is questionable, Foxconn workers have been known to leak accurate information in the past, and the document is consistent with recent rumors from more trusted sources. It does not appear to make any reference to front camera features hinted at in an iOS 9 manifest file, such as a flash, panorama shots, and slow motion or 60 fps video. Software support does not guarantee features will appear in shipping hardware, however.